Avon talks a good game about “crusading” against the deadly disease, particularly when October rolls around. Yet the beauty firm has far to go before it walks the walk, according to the Campaign for Safe Cosmetics, a coalition of health and environmental groups dedicated to eliminating toxic chemicals from cosmetics and personal-care products. Avon’s 20-year-old “Breast Cancer Crusade,” claims the organization, is one of the most egregious examples of “pinkwashing,” a term coined by Breast Cancer Action in 2002 to describe companies who promote pink-ribbon merchandise but continue to produce, manufacture, or sell products linked to the disease. Breast cancer affects more than 1 million women worldwide each year, with women in industrialized nations experiencing the highest rates of disease. In the United States, a woman has a one-in-eight chance of being diagnosed with the disease, and nearly 40,000 women die from it every year. 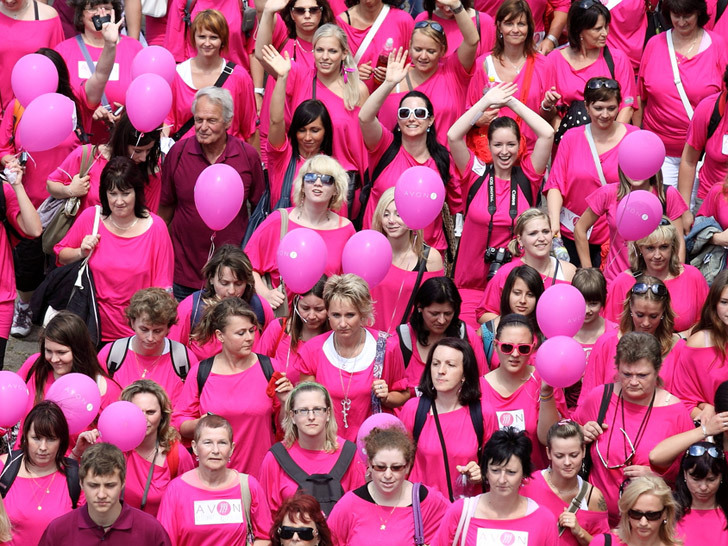 Mounting research shows that breast cancer isn’t simply genetic. Environmental exposures to toxic chemicals through art, food, water, cosmetics, cleaners, plastics, and furniture are contributing factors in a large number of cases. Although Avon claims it’s “in it to end it,” the firm continues to use chemicals linked to breast cancer and other diseases—including parabens, triclosan, and formaldehyde-releasing preservatives—in its products, notes the Campaign for Safe Cosmetics in an online petition. 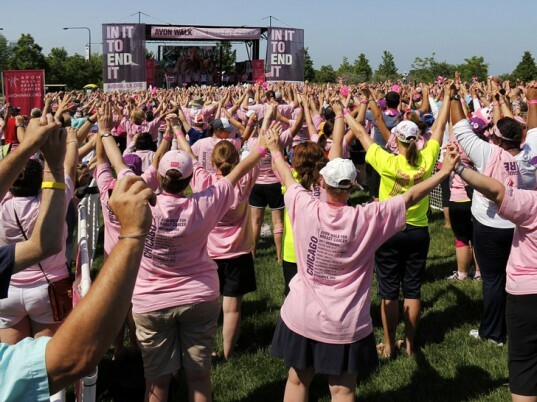 If Avon is serious about ending breast cancer, the group adds, it needs to “meet or beat” Johnson & Johnson’s recent pledge to rid its products of cancer-causing chemicals. Although Avon claims it’s “in it to end it,” the firm continues to use chemicals linked to breast cancer and other diseases. A paper in the June 17, 2011 issue of Environmental Justice cites Avon’s “Kiss Goodbye to Breast Cancer” campaign as one of the company’s most “poignant instances of pinkwashing.” Designed to raise funds for breast-cancer research, the initiative launched in 2001 with six shades of lipstick (“Courageous Spirit,” “Crusade Pink,” “Faithful Heart,” “Inspirational Life,” “Strength,” and “Triumph”) that may have contained hormone-disrupting ingredients linked to breast cancer. But that wasn’t all. “Avon is one of the most recognizable corporate entities participating in the breast cancer awareness industry and according to the Massachusetts Breast Cancer Coalition, more than 250 of Avon’s products listed in a database assessing the health risks of cosmetic products are listed in the ‘highest concern’ category due to the presence of hormones,” Amy Lubitow and Mia Davis write in the journal. In 2005, Avon shareholders voted 95 percent to 5 percent against a resolution to reformulate, in a reasonable time frame, all its products to be free of chemicals banned by the European Union for known or suspected associations with cancer, genetic mutations, or birth defects. I'm recently diagnosed with Squamous Cell Carcinoma in the breast area. I have used the same Avon product since I was in high school, going on 40 years. I have been spraying Avon Candid on my body almost every day all this time. It's the only thing I can think of. I have never smoked, never done drugs, have no tattoos, was not one to lay in the sun very often. Now I have cancer in the breast area. A skin cancer in the internal layers of my skin, where I have sprayed Avon Candid all these years. I no longer use it. I have had surgery to remove the tumor/lump. Six lymph nodes removed and one came back as cancer also. I had to have a medi-port put in for chemotherapy, and am now doing chemotherapy and also have to do radiation. I just really wonder if this is the cause of my cancer. I am a breast cancer survivor (it has been 4 and a half years actually) and it was hard to look back and see all of the chemicals I have been unknowingly slathering onto my skin- some of these sunscreens, deodorants and beauty products I have been using since I was 12=( I get my skin products from a natural company based out of Colorado now (www.martisessentials.com) and I will never use these chemical-ridden products again. I appreciate these companies coming out with things we can use that will not harm us. Thank you Nina. Appreciate the link. Done with chemo, done with radiation. But now dealing with Radiation Pneumonitis, lung damage caused from the radiation treatments. Hopefully we can get this under control before it becomes fibrosis of the lungs, permanent lung damage. Went 5 weeks with docs saying I had a bronchial infection, pneumonia, a-typical pneumonia, which the medications (antibiotics) didn't work at all. Referred to a pulmonary specialist, had a bronchoscopy, and biopsy's of samples from my lungs. Thank goodness no lung cancer, but confirmed the radiation pneumonitis. Currently on high dose prednisone. One day this will be behind me.